A speech text that’s absorbing, interactive—and affordable. Written by professors with 40+ combined years’ experience teaching the course, Speak Up! 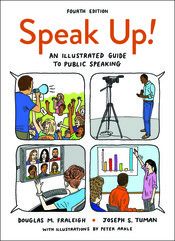 connects with students through lively writing, compelling real-life examples, practical guidance, and hundreds of custom-drawn illustrations that bring public speaking concepts to life. Instructors appreciate the book's serious coverage of concepts and theories, fascinating examples, and unique and often humorous illustrations that help students understand and retain concepts from the text. The new edition features a brand new case study feature that guides students through all steps of the public speaking process. The Speech Choices boxes follow Mia and Jacob as they make choices that affect the final outcome of their speech—and show students what to do, and what not to do. They culminate in two brand-new, full-length speech videos on cutting edge topics. The feature expands further online in LaunchPad with video clips from the speeches, case study questions, and case study activities that instructors can use in the classroom or assign as homework. Speak Up contains other powerful digital tools accessible through LaunchPad, a learning platform that that contains hundreds of videos, LearningCurve (our adaptive quizzing program), various assessment options, video assignment tools, instructor supplements, and a full e-book.